In Behind the Seams, the editors and authors reflect on the oft-hidden path from initial submission to published piece. This feature centers on a recorded audio conversation—not an interview, but an open-ended discussion—built around observations and recollections of what stands out in the process of developing, editing, and publishing an article with JITP. Benjamin Miller and Joseph Ugoretz in conversation with Issue 2 author Brian Beaton. BM: All right, so: after some technical difficulties, here we are, having a conversation, starting our inaugural Behind the Seams project to look at the path that one article has taken from its origins to publication in the journal which we refer to as JITP. BB: I’m Brian Beaton; I’m an Assistant Professor at the School of Information Sciences at the University of Pittsburgh. BM: —and also an editor of The Journal of Interactive Technology and Pedagogy, as am I. My name is Benjamin Miller; I am a Ph.D. student in the English Department at the CUNY Graduate Center. And so the article that we’re looking at is by Brian. Brian, do you want to just say the title for the record? BB: Yeah, sure. The article is called “Other People’s Digital Tools: Adaptive Reuse, Cold War History, and the GSA’s Real Property Utilization and Disposal Website.” It’s a short, catchy title. BM: [laughs] But it says what it does, and that’s a thing that titles have to do. BB: It’s been retitled as it went through the revision process, and so, you know, it does connect up with our conversation a bit. The real key part of the title, I think, is this idea of other people’s digital tools. And the sort of quick history of this piece: I originally wrote this piece thinking that it would go in the Tool Tips section of JITP, and I originally had this idea of a review of an electronic resource, explaining how it can be used in a classroom for teaching purposes and research purposes, but I wanted to write about a resource that wasn’t designed for that. I initially wanted to produce a piece that was more a kind of act of exposure or flagging a resource that maybe isn’t immediately obvious as a resource, and point out that there’s this electronic resource that’s been developed for property developers to acquire these surplus properties that actually contains—inadvertently—a whole lot of information about sites that we don’t know a lot about. So that was kind of the original idea for the piece. BM: Right. I think one of the reasons that I thought, you know, this should really be a full-length article in Issues, rather than kind of the shorter, “Here’s a Tool Tip,” is that it’s not a tool that’s designed specifically for scholars and students, right, so Tool Tips I think of as being, “You may have heard of this. Here’s how to use it well.” But to say, “Here’s this thing that is not designed for this,” that to me needs more attention. JU: Yeah, so let’s zoom in a little bit on the process of going through the editing and getting it through the steps of getting it into JITP. Is this an article that you kind of had ready to go and were shopping it around? ’Cause that’s generally what I will do. I have an idea for a piece, and I’ll sort of write it, or at least a major draft of it, and then look for a home for it. Or did this work in a different way? BB: No, this worked in a slightly different way. I originally had done field work, which I think is referenced in the article. I was doing field work a few years ago, actually trying to document the physical disassembly of these military installations, and I used that as an example. So that work was obviously done, and that was work [that] for lack of a better phrasing, was just on my laptop; I hadn’t really done much with that. Sometimes you do fieldwork, and you think it’s part of one research project, it doesn’t sort of connect up with where that project goes, and it ends up in a folder somewhere. BB: I think it’s about being part of a larger conversation, and part of a larger community. For me I was really drawn—it had never dawned on me, you’re right, now that you say that, I was thinking, why didn’t I just blog? BM: [laughs] Too late, too late. JU: Too late. You can’t use it on a blog now. BB: It never dawned on me. And it never dawned on me because I think that these fields—particularly Cold War Studies is a good example, it’s a really lively field, where a lot of work is coming out right now, and so I also think it’s a field that for whatever reason has not yet very closely linked up with conversations in say digital humanities, digital history, these kinds of things. There are a few projects I can think of that are quite good, but for the most part you don’t see a real interest in using technology to have these conversations or to talk about the Cold War in any particular way. So I guess, I mean maybe—I think it’s about being part of [a] scholarly community, you know, and I think also about again trying to update and innovate these conversations and how they happen, like we’re doing right now. BM: Yeah. Can I just ask for my own curiosity: so you’ve got this archive, you’ve got your photos from having been there, you’ve got the website: you want to be part of a scholarly community. At what point does JITP come in and crystallize for you [that] these two things can go together? BB: Yeah, okay, a couple of things. I would say I was really drawn initially to the Tool Tips section, even though this is not where this paper is ending up. It’s that section that caught my attention, I’ll be quite honest. I was—I thought it was a really good idea for a section, you know? I think right now, journals, academic publishing, academic journals, they tend to have these stock sections that have been developed . . . for the lack of a better term, in the analog era. You know, they have book reviews, they have scholarly articles, they sometimes have obituaries and memorials and those kinds of things. They have, sometimes, job announcements. I liked what JITP was doing in terms of trying to rethink stock sections, if you will. So not getting rid of having sections, but reimagining them for this particular moment in scholarly communication. The kind of renamings and regroupings that JITP was doing, in terms of using and misusing, and like you say, I think taking some risks in terms of the kind of academic work that you’re soliciting, it just seemed to be a good match to me. BM: But you started saying that was your initial idea. So did that change, and if so, when? BB: It changed through the process. So I submitted a piece, and I think if you go back, and in fact I was looking at it earlier today, you can see that there’s a little note that I’ve put that says, “I am not sure where this goes within the journal.” There’s like a little warning on the front, you know? And what happened was I got it back, I got the paper back, and the reviewers picked up on these tensions. And so you know there’s this part in the first version of this paper, and even when I was writing it, you know, I felt this, where I’m like, I’m saying, “. . . Isn’t this an interesting resource that can be borrowed or appropriated, oh but by the way it’s really hard to navigate and to use.” And so I think the reviewers picked up on that. And so their comments initially—you know, they wanted me to flesh out both of those things. BB: And so I got these comments back, and thought, oh, okay, yes. I mean, they’re spot on in terms of flagging I think what’s an interesting sort of tension or what’s lurking here in the piece, and also flagging that problem of why point out a resource that people don’t know about if it’s also not particularly easy to use or navigate? And so I actually was forced to sort of grapple with that, or use it as an opportunity to think about it in response to their comments. And in thinking about it, I realized that that was the very point: the fact that it was so hard to use wasn’t something to sort of skirt around and kind of be nervous about as an author. Instead, I decided to run with that and say, “Okay, you know, this is something that is hard to use—maybe that’s the whole point—and what students can do, and the value in this idea, is having them remake it.” And I started thinking more about this kind of [as] not just digital making, but remaking, and not just tooling, but retooling. JU: So Brian, you went pretty smoothly through the process. You submitted, you had some comments from the reviewers, and from Ben and me, and you were able to revise in a way that kind of really addressed those, but strengthened the piece. Or at least, did it strengthen the piece in your eyes? BB: I was really struck by it, in some ways. It seemed really generous to me. I thought, “Wow. Okay.” And what happened is it started to turn really workshoppy, where I felt like, and I’m being sincere, this is the first paper that I’m publishing where I wish we actually could just keep doing this: I wish we could just keep doing this back and forth, you know, for like another two years, because I would love to see the paper that emerges two years from now in doing this. BM: That is really great to hear [laughs]. In talking about the kinds of workshoppy-ness of the comments and the transformations that the text has gone through, I notice Brian that you’re focused (reasonably) on the ideas, right? But as I was marking up the .pdf version in August, which was the second revision, I would suggest a paragraph swap, or dashes, or these really minute things just to bring out what I saw as those ideas in a clearer way, just ’cause of my background—I’m a compositionist—and so I’m totally interested in whether that was invasive, whether it was useful, whether it was some combination of those things. Even just for myself moving forward as an editor, that style or that sentence-level control of emphasis, is that something that was useful? BB: Yeah, it was. I mean . . . you’re making me realize that I think one of the things that editorial boards could have is a style editor. You know, we always—we farm out papers and we say, you know, “Reviewers, can you review this paper? Here’s the deadline.” And it’s usually subject specialists, you know, who might find some grammar stuff, some clarity stuff, but for the most part it’s usually content-based reviews. The idea of adding in to the peer review process, you know, actually institutionalizing or formalizing a style person, would be really, really, I think, interesting, provocative, useful.. . . I appreciated those comments, immensely. They worked. I tried them out, like I remember, where it was “put dashes,” or whatnot, and I thought, okay, you know, I’ll try it. I did it and was like, “Oh, yeah, he’s right; this sounds better.” And I mean, in some ways what you saw, I think, you saw a really compliant author . . . I’m not, actually; I don’t self-identify as particularly compliant in that way normally. BB: There’s a couple of things that got dropped out of the piece, tiny phrasings or words or that kind of thing. You know, this phrase “trespassitory ethnography” that I sort of coined in the first version of this paper. It got dropped, and you—it got dropped from the second version, and you flagged that again, and you said, “Hey, where did that phrase go?” and it’s actually still not back. It’s very—it’s very helpful to have that kind of feedback, and to have this kind of back and forth. I mean, I can’t think of another example in working with editors where someone has asked me, “Hey where did that go?” That exchange right there really captures this kind of workshop element that I think that you somehow have been able to set up, and I think is really effective and really improves people’s work. JU: So just as a way of wrapping up, is there something that we’re missing, something that we really should get in here about the process, or about the piece? BB: I sincerely wish there was a way to tell other authors, other scholars, you know, if you’ve been burned by your experiences in the past with other journals, or the process of scholarly writing and publishing. I don’t know. I only have positive things to say. This paper got better. While reading through this chronicle of our experiences , there is a particular term that may be conspicuously absent depending on the particular realms of academic discourse you follow: digital humanities. Digital humanities as a concept has rocketed to national prominence in recent years as both a legitimate movement and a buzzword of questionable deployment. While I don’t want to fully engage with the complexities of its history or the nuances of its varied interpretations,1 I want to explicate a little of why it is absent, because its absence is intentional, and it relates to the sense of considered timeframes I touched upon when discussing the challenges of the digital-born QP. This desire for widespread acceptance and wholesale institutional integration is unfortunately at odds with a good part of digital humanities rhetoric, which in a political move is often situated in a position distant or apart from, and in some cases even antagonistically against, more traditional humanities work. Take for instance the Digital Humanities Manifesto 2.0, which claims that digital humanities as a phrase should be rejected “to whatever degree it implies a digital turn that might somehow leave the Humanities intact: as operating within same stable disciplinary boundaries with respect to society or to the social and natural sciences that have prevailed over the past century.”3 In this sense, digital humanities can be seen as a movement that seeks a break, and the Digital Humanities Manifesto 2.0 as a document meant to invigorate the frustrations that wish to shatter traditional humanities work. Notably this list includes few activities that are applicable specifically to humanities research questions, and in fact reads more like a list of pan-disciplinary concerns and technologically impacted possibilities that are equally relevant to the sciences and social sciences, and in fact to practices outside of the academy as well. This is not to say that there is not good work being done under the banner of digital humanities. Work on curricular and community development in the digital humanities by researchers such as Lisa Spiro5 is helpful in establishing practices similar to those we have developed at the BGC. There is also a wide array of centers and initiatives, such as George Mason University’s Center for History and New Media (CHNM) and HASTAC, that fall under the umbrella of digital humanities and have very similar missions and distinguished records of accomplishment. But the term remains too contested, too fractured, and too frequently held up as a banner for radical change to be safe enough in the development of digital practice across an entire institution and with a wide range of constituencies. Because of its connections to such particular ideologies, it can become one of those dangerous flashpoints that inadvertently turns people away from a project that is focused more on the evolution of humanities methodologies and forms of practice than a radical dissolution and reconception of humanities research. So, no how matter how much I find work done by a self-labeled digital humanist useful in helping to shape our program or deploy tools, such as Zotero and Omeka, that are developed by digital humanities centers such as CHNM’s, we continue to use the term sparingly and cautiously at the BGC. This is a time ripe for radical rethinking of many aspects of academic structures, and digital tools may in fact help hasten that process and be the impetus for real structural change. But our local mission is to provide the humane cyberinfrastructure within which the BGC community can learn to master those digital tools, rather than to champion a specific ideology or stance within that change. We may have opinions as to where those tools might lead academic practice, but the most powerful pedagogical move we can actually make is providing individuals in our community with the resources and knowledge to explore the field on their own and make their own decision about the direction in which they would like academia to head. Kimon Keramidas is Assistant Director for the Digital Media Lab at the Bard Graduate Center where he is responsible for the development and implementation of digital media practices across academic programs. His research focuses on digital media through the lenses of political economy and sociology of culture, and he is currently working on a book project about contemporary corporate theatrical production and a gallery project on the materiality of computer interface design. Kimon received his PhD in Theatre from the CUNY Graduate Center where he also completed the CUNY Graduate Center’s Certificate in Interactive Technology and Pedagogy. In this paper, we address the use of “virtual space” as a learning environment. With the advances in e-learning systems, the education community shows a growing interest in using online tools for educational purposes. The case studies presented in this paper demonstrate how a 3D virtual environment can be used as a learning tool by providing a virtual space that allows people in different locations to interact and gives users access to facilities, settings, and even people not available physically. These case studies are related to presentation of native dance styles, learning language for English as a Second Language students and simulation of archaeological excavation site for History students, all done through Carleton Virtual, a 3D virtual environment for Carleton University. Based on the results that show the advantages of using the virtual space as a learning environment, we argue that virtual space can introduce a new educational paradigm. As educators, we are interested in making our teaching and research as accessible as possible. Sometimes, it is a question of geography—physical facilities and spaces such as research labs and university campuses are location-dependent and only accessible to those in that geographical location. Other times, some training and research activities require the development of fieldwork or complex simulated environments that are either too costly or impossible to arrange (e.g., training emergency personnel on handling major disasters). In addition, it has been recognized that innovative work requires collaborators to share tacit and explicit knowledge freely (Brown and Duguid 2001), which requires the rich communication usually associated with face-to-face interaction, enabling people to transfer individually held knowledge and synthesize it to fashion new collective knowledge. In this paper, we discuss three case studies that demonstrate the use of a three-dimensional virtual environment (3DVE) as a “virtual campus” and a step toward widening access to both research and teaching. Our case set consists of (1) a virtual presentation of the dance styles of native North American people used as an example in a course on Interactive Media and Digital Art, (2) a framework for language learning for English as a Second Language students, and (3) a simulated archaeological excavation site for history students. 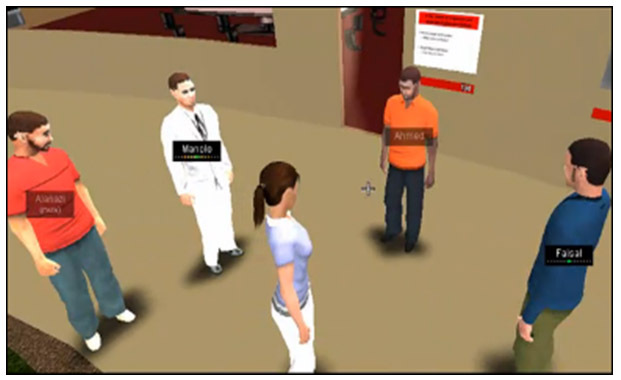 The 3DVE used in the discussed cases is called Carleton Virtual, a virtual campus developed by researchers at Carleton University using web.alive, an avatar-based 3D tool by Avaya (http://avayalive.com/Engage/). The academic uses of 3DVEs have been reported and discussed by other researchers, but serious limitations exist both in the functionality provided by these 3DVEs and the evidence of their usefulness as academic tool. Through the presented cases, we hope to show the particular features of our proposed solution (intelligent agents, communication and collaboration, 3D spatial voice, scripted events and interaction, etc.) and also the advantages of 3DVEs in general as educational tools. These case studies collectively and progressively demonstrate a series of features that can improve the educational experience: The first case shows the ability of 3DVE to provide information in a more engaging way by including non-player characters (NPCs) and some artificial intelligence (AI). The second case adds communication, collaboration, and environmental simulation. Finally, the third case advances the simulation to a more interactive task and also shows how the 3DVE experience can be customized and integrated within a special web page. In the following sections, we begin with a review of some related work, then continue to the general structure of our framework and the particular structure and results of three case studies. Finally, we will provide a discussion and some concluding remarks. Eysenbach et al. (2004) have argued that the advantages and disadvantages of using virtual communities for health and education still need to be studied. This point is also raised by some other researchers such as Demiris (2006 and 2008) and shows the need for further studies on the functionality required for the educational use of 3DVEs. Second Life (http://www.secondlife.com) is a 3DVE that has been widely used for social, educational, and commercial purposes. Boulos et al. (2007) have provided a good review of potential uses of Second Life and other 3D virtual environments for health and medical education. They argue that 3D environments provide an immersive, realistic experience that can combine communication, entertainment, training, and access to a variety of data types. Callaghan et al. (2009) also report the use of Second Life for technology education. They notice the need for some simplifications (for example in teaching engineering equipments) which can be a problem but also mention partial integration with a content management system, Moodle (http://www.moodle.org) which is a considerable advantage. Danilicheva et al. (2009) explore the educational values of 3D virtual worlds but from a storytelling point of view. Their work points to the value of artificial intelligence and also uses stereoscopic 3D to increase immersiveness. The common conclusion seems to be that virtual communities may provide a more flexible and accessible learning experience, empower users (students, professionals, patients, etc. ), and enhance coordination of education/care services. Issues with Second Life and similar products mentioned by these and other researchers include limited ability for scripting and artificial intelligence (used for NPCs and events), difficult integration with other tools, lack of web-based operation and spatial 3D voice, and inconvenient business models for users. Unity (http://www.unity3d.com) is a 3D game engine with growing popularity that addresses some of these issues but still doesn’t provide proper integration with other applications (e.g., the containing web page), spatial voice, user customizable avatars, measurement tools, and some other features. Web.alive tries to address some of these issues as discussed in the next section. Carleton Virtual (CV) is a 3D educational virtual environment developed by researchers at Carleton University and built using support from Avaya (http://www.avaya.com) and its web.alive technology (http://www.avayalive.com), itself based on Unreal Engine (http://www.unrealtechnology.com). The research group (including faculty and graduate and undergraduate students) initially reviewed and tested major alternatives for 3DVEs including Second Life, OpenSim, Wonderland, Unity, and some in-house solutions, then established a partnership with Avaya to provide the base technology, servers, and technical support. The researchers then developed the base campus and also specific elements for three courses as pilot projects (the case studies presented in this paper). The research group consists of technical members (faculty and research assistants for system design, content creation, scripting, etc.) and educational members (faculty and teaching assistants for the course design). As shown in Figure 1, CV provides spaces for lectures, presentations, collaboration, social interaction, and special activities. Figure 2 captures some views of the virtual environment that was designed to resemble the actual Carleton University campus. The design keeps some of the characteristic features and elements of the campus but allows modifications to improve the space usage and customize it for the virtual activities. Current implementation of CV includes only the main “quad” area of the university campus. The quad consists of a recreational area with a library, main administrative building, one academic tower, and two smaller buildings. The actual Carleton University campus is much bigger and is not fully implemented in CV. The quad area buildings are also significantly simplified in CV. On the other hand, a new gallery building, native village, and dig site are added. Researchers from the School of Architecture helped design the CV environment. The content presentation is done through surfaces (screens) that can show videos, images, presentation files (supporting Powerpoint and PDF), and real-time web pages. This allows instructors and other participants to easily access content and update it in real time while in the environment. The system also allows 3D spatial audio. The sound level can be independent of distance (e.g., for speakers in the lecture hall) or change based on avatars’ distance (for local talks). At any time, users can know who can hear them and can control different audio features such as temporary mute. Different “areas” in the environment can be defined to simplify environmental control (e.g. setting up private meetings in a room with restricted access only for a group of users) and behavioral monitoring (e.g. keeping track of users who enter a room, etc). General activities like lectures and collaboration involve tasks like presenting content in different forms, meetings, and social interaction. They are used in both case 2 and case 3. Special activities are those not commonly used by educators and students. The primary examples are the virtual dance and the excavation site discussed in cases 1 and 3. The unofficial PC-only prototype for CV can be publicly accessed at http://img.csit.carleton.ca/vcu. The implementation of this solution is broken down into two parts: (1) CV content, and (2) Web.alive base. The content is a set of 3D assets generated using standard software tools and environmental controls such as events, triggers, scripts, and volumes, defined using the web.alive editor (which also serves as the tool to put together all the assets). Content development is done at system and course levels. The general CV system is designed for basic academic functionality by the technical members of the research team. Instructors then design their courses and the related tasks based on existing general features (like presentation space) or ask for specific features (like a dig site) to be developed for their courses. This development is done by the technical team with occasional support from the Avaya staff. Since the basic system design includes many required academic features such as communication, presentation, and submission, it is expected that many new courses will not need extra content and can be developed by the instructors with minimal technical support. Web.alive technology is based on the Unreal Engine by Epic Games (http://www.unrealtechnology.com). It embeds the Unreal Engine within a web-based product and adds a series of commonly needed features such as web integration, security and user authentication, and measurement and inspection tools. At this time, web.alive supports PC and Mac but no mobile devices. Web.alive content is located on special servers that can be run by Avaya or by content owners. For the purpose of this research project, we used servers provided by Avaya as in-kind support. One of the strengths of web.alive technology is instrumentation and measurement. An overview of the telemetric instrumentation and data collection tools in web.alive is beyond the scope of this paper as they were not widely used in the presented cases. Using web.alive’s analytic tools, we can browse through encounters of each user, view conversations that occurred within the environment, observe traffic and conversation patterns based on the interactive heat-map tool, and much more. For example, using the heat-map tool we are able to observe the influence of conversation on active duration within the environment (Figure 3). As indicated by the graph, those users who did not actively participate in conversation within the environment during the pilot window were far more likely to idle or leave the environment. This is an excellent indicator of the importance of encouraging user participation in conversation during learning sessions. We can also see the distribution of logins to the environment both daily and hourly. What is most important to note from this type of data is that users not only enter the environment for the specific task, but also enter and spend time at other points, likely to collaborate with others and practice their simulations. Other available analyses allow us to identify those that were most active in encouraging participation from others, and the most popular actions and locations within the environment (through heat-map). Native dance is an inseparable part of First Nations’ culture, and understanding it is necessary for relating to this culture and preserving its heritage. The study of First Nations’ culture, including their music and dance styles, has received considerable attention from both the aboriginal community and other scholars. Recently, with the growth and popularity of the Internet, some dedicated websites have provided invaluable content for those who wish to learn about these subjects. But digital and interactive technologies are more than a means to collect content on the web. New media present new possibilities for understanding, presenting, and preserving any type of information, and these possibilities have not been fully utilized for First Nations’ cultural heritage. 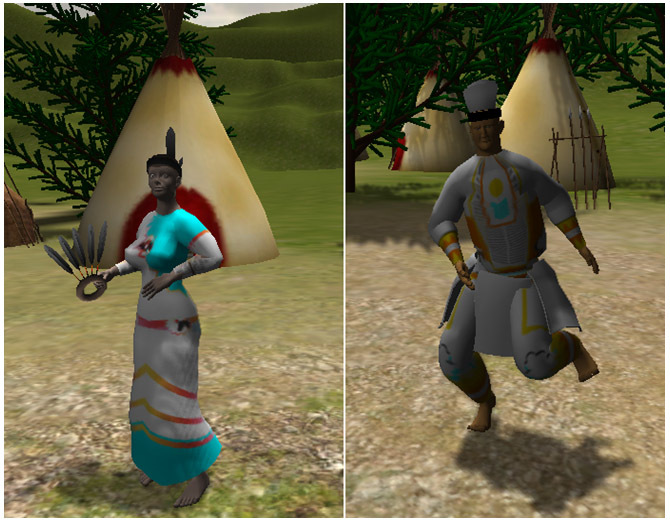 As part of a graduate research project before the development of Carleton Virtual, we developed Virtual Powwow (VP) using the state of the art in multimedia and human-computer interaction to add a new dimension to the way we understand and enjoy native dance. VP allows users to experience an authentic powwow online, interact with it (get closer, pause, and look from different points of view), study the movement in details, and get extra information in a variety of formats including text, audio, and video. Photographs of native villages and dancers are used for modeling objects and clothes while the performances of real native dancers invited to a motion capture studio is used to create animation of virtual characters. VP was originally designed as a separate project using the Unity game engine (http://www.unity3D.com). After the development of CV, selections from VP were ported to CV to be used in possible courses. Integrated within the Carleton Virtual environment, the Virtual Powwow has become part of the virtual campus although it has no analogue in the physical campus. At this time the interaction between users and VP is limited to browsing the environment and starting/pausing the dance. Figure 4 shows some views of VP, and sample videos can be seen on the website: http://img.csit.carleton.ca/vpow. It has links to original Unity-based 3DVE and sample videos; for example: http://img.csit.carleton.ca/vpow/GrassDance-July-22-08.wmv. VP can be a significant educational tool for any course that deals with native dance styles, from North American history to arts and culture. Although the native community has always respected and preserved its traditions to the best of its abilities, and a considerable number of scholars have done valuable research on this preservation, advances in multimedia hardware and software have not been fully utilized in this regard. For instance, Native Dance (http://www.NativeDance.ca) and Native Drums (http://www.NativeDrums.ca) are two websites supported by Carleton University that provide a wealth of information on these subjects. However, they are still collections of texts, images, and traditional audio/video recordings. New media and interactive digital technologies provide more holistic tools to understand native dance. Certain native dances have been studied by a few scholars and researchers. Detailed analyses of movements and styles are extremely limited, especially those using new technology. Franz Boas (1944) was one of the pioneers in such studies. Gertrude Kurath (1986) produced the most detailed native dance studies. Her studies of native dance for Iroquois nations (Kurath 2000) combine the musical information with her own notation system for recording dance moves and choreography. 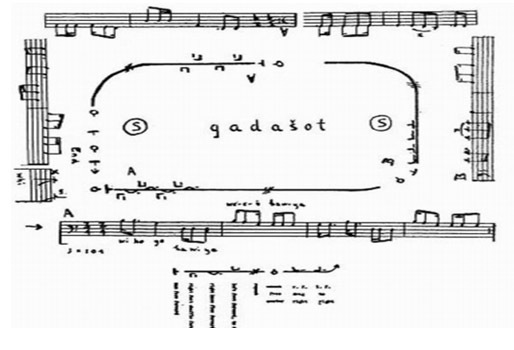 Kurath’s notation consists of ground plan, choreography, and music, as shown in Figure 5. Kurath’s primary movements are mostly limited to lower body steps. Her notation does not provide enough details for proper understanding of dance styles, especially without a video recording. Figure 5. Example of Kurath’s notation. Dance cycle is shown using special symbols, and the music is written around it. Unfortunately, more recent works do not provide more detailed (or quantitative) analysis for native dance (Wright-McLeod 2005). Those accompanied by videos try to address this shortcoming but are limited by the quality and point of view of the video. Using VP, instructors and students can interact with authentic virtual native dancers, browse through a native village, and learn about First Nation’s’ art and culture in a way that wasn’t possible otherwise except by attending occasional ceremonies on expensive and difficult field trips. During the pilot phase of CV, ten graduate students (mostly from engineering programs) in an introductory course on Interactive Media and Digital Art were asked to compare four different media types (books, videos, multimedia websites, and virtual environments) for the common task of finding information on native dance styles. They were instructed to use books and videos available in the university library, the native-dance.ca website, and the VP environment in Carleton Virtual. The students were given a series of evaluation criteria but were also told to add other criteria if they found the given set lacking. The purpose of the task was to understand the role of features of digital media compared to more traditional ways of accessing data. The native dance was only chosen as an example because information about it was available in different media types. Overall, the results show that a 3DVE such as VP can provide significant learning potential that makes it a strong candidate for a learning space. The assessments were done on a five-point Likert scale, where the students evaluated each media type using a set of criteria, as shown in Table 1 (average values). The students found 3DVE the most pleasant and engaging method but it received lower scores for access to different types of info and ease of use. As mentioned by some students, the type of information available on VP was limited not because of the medium itself but mainly because textual information has not been implemented in VP yet. As the next two cases show, the 3DVE method can easily be integrated within a website or have built-in textual parts such as notice boards, presentation surfaces, and interactive submission tools. On the other hand, the ease of use may remain an issue for some users and for some types of data as it is a more complex navigation system compared to other methods, although it will be easier with practice. This was also confirmed by some students. The course was not about native dance styles, and understanding them was not the real objective of the course. Consequently, the task was only one short assignment within a course related to interactive technologies and digital art which included many other tasks not related to this paper. Compared to other case studies, this case was relatively small and included simpler and shorter tasks for students. It should be mentioned that the VP itself was a big project including many features that were not necessarily used in these tasks. The current trend toward “hybrid” or “blended” learning in post-secondary education is driven by the ever increasing access to various modes of technology, student familiarity with these technologies and changes in learner attitudes towards learning. Today’s tech-savvy students want more choices in education delivery as a result of different learning styles, work and study schedules, and access to new technologies. For language learners, computers and internet technologies can provide exciting new opportunities but require careful planning, collaboration, time and some technical know-how on the part of the teacher. In the language case, we investigate the use of CV for a language-learning scenario. Initially the teacher, who had no prior gaming experience and was a novice to 3D immersive environments, was hesitant to design and pilot a task, but she was keen to experiment with this new learning platform and motivated by the opportunity to collaborate with colleagues from other departments. Designing 3D learning scenarios and tasks requires collaboration with experienced technical and educational designers—a design team. After several frustrating attempts at designing a language-learning task for CV in isolation, the teacher took the opportunity to experience the environment with one of the 3D technical designers who demonstrated the many benefits of the environment, including classrooms, collaboration surfaces, and synchronous voice and movement. This hands-on experience helped the teacher conceptualize the types of language-learning tasks and opportunities best suited to this type of learning environment. The team then focused on designing learning scenarios that might not otherwise be possible in a traditional language classroom. The teacher’s initial frustration was likely caused by trying to replicate tasks used in a traditional language classroom. The challenge now was to create a learning scenario or task late in the term that might help motivate and engage this particular group of learners. Teaching English as a Second Language for Academic Purposes (ESLA) to international students can be pedagogically challenging at the best of times as some students easily become disenchanted or unmotivated and have difficulty appreciating the value of the course, especially toward the end of term. Traditional classroom tasks attempt to promote collaboration and critical thinking through group work and careful task design, but too often are overshadowed by teacher-talk and instruction. Consequently, any method of delivery that might engage and motivate students was worth pursuing. Further, any context or task that that might promote oral interaction and opportunities to speak, collaborate, and negotiate by its very nature should produce rich opportunities for language use and production—something the classroom was not necessarily providing at this point in the term. Intuitively, using CV as a learning environment might lead to increased language proficiency and accuracy. This pilot project was designed so that students and teacher from an ESLA class could explore a learning opportunity in a 3D immersive environment. It made use of the existing Carleton Virtual framework, which provided participants with a unique opportunity to practice interacting with classmates and teacher using a common linguistic reference (English) in a risk-free environment. CV allowed students to collaborate at their convenience in a space that replicated the Carleton campus library and other buildings but that was mutually convenient to the participants in terms of time and accessibility. In particular, students were encouraged to meet in any of the ten designated library rooms, and final presentations were held in a replicated auditorium. This project was piloted with an advanced ESLA class. To begin, students were introduced to the concept of online learning and virtual worlds and learning environments through several related sources (Ally 2008; Augar et al. 2004; Sweeney 2008; Vickers 2010). These reading and listening sources were assigned during regular class time and for homework. Corresponding tasks were designed to help students develop an initial understanding of the issues and challenges associated with learning in a virtual or online environment. For example, in-class activities alerted students to the advantages and disadvantages of online and 3D immersive learning, and identified some basic learning theories. In-class activities included debating pros and cons, comparing traditional to 3D learning contexts, and using specific learning examples to describe the benefits of immersive learning. Additionally and through specific exercises, these readings and activities helped to establish some academic and topic-related vocabulary such as “virtual,” “theory,” “participate,” “environment,” “communicate,” and “immersive.” Students later attended a virtual workshop wherein they were to have experienced first-hand the CV environment. Unfortunately, students were not able to log in as actual users due to an unexpected “plug-in” issue in the school’s lab; however, workshop facilitators were able to demonstrate how the avatars moved around and the different physical meeting spaces within the virtual environment on personal laptops. Next, students were given the actual task. This consisted of a choice between a more traditional group research project and presentation or a virtual group research project and presentation. Student groups then had the choice to compare either two nongovernmental organizations or two virtual learning platforms. These subtopics were related to the broader course themes of sustainable development and eLearning. Students who chose the traditional group presentation had to arrange their group meetings on campus, and the final group presentation took place during a regularly scheduled class time. Alternatively, students in the virtual groups were required to meet, collaborate, research, and present exclusively in Carleton Virtual at a mutually suitable time. During the course of this task, students were encouraged to reflect upon and keep notes on any experiences (actual or anticipated) and try to articulate on any apprehensions about learning in a 3D environment. Group presentations, traditional and virtual, were evaluated as part of the final grade. The five virtual groups had 3-4 students each. Each group was required to meet at least three hours per week for the duration of the course (two weeks) and once more just prior to the presentation. Groups met in designated meeting rooms in the CV library in order to collaborate on the research, prepare the slides, and practice the group oral presentation. The teacher held virtual office hours each week and randomly joined the groups to troubleshoot and to verify that groups were on task and working in the target language. The final group presentations were made on stage in one of the simulated university auditoriums. Members of the other virtual and non-virtual groups attended the live presentations. Participants, the teacher, and a member of the research team logged in from their homes to either present or listen. Figure 7. Students interacting in CV library room. For each avatar, name and sound volume can be presented in a small box over the avatar. Understandably, the ultimate success of a virtual learning task depends not only on the actual task design, but largely on the environment and the tools available within the immersive environment. As CV physically replicates the Carleton University campus, tools available to users are similar to those that students depend on normally to accomplish their academic assignments. The additional bonus is this environment gives students the flexibility to work from home and at any time. For instance, in each of the library study rooms, students can use either of the two available collaborative surfaces to jointly access content from the Internet and/or upload files from a shared drop box. While these tools are available in traditional working environments, what makes this experience unique is that the students can perform from home and under the persona of their avatar. The option to personalize their own avatar was appealing to many students as they could choose to alter such avatar traits as hair, skin and eye color, clothing, height and weight, and even gender. This simple act of representing oneself somewhat fictitiously (through a personalized avatar) generated spontaneous language production and even humor as group members commented on each other’s changing appearance from day to day. Students liked the “game-like” scenario and had fun using the avatar options. Further, students appeared to take advantage of the relative anonymity of their avatars to take risks with their language without the worry of being judged by their teacher or classmates as in a traditional classroom setting. Perhaps our most exciting observation was how some student groups embraced this opportunity with new-found enthusiasm and energy (this project was introduced towards the end of term when motivation was beginning to wane); this enthusiasm translated into professional and well-executed group oral presentations. Not only did several groups pull off strong content in their slide presentations, but they had clearly practiced their presentation “etiquette” as evidenced by their stage presence, authentic and “true-to-life” mannerisms, and well-timed delivery. Some student groups also demonstrated great pride and care as substantiated by their carefully groomed avatars. In addition to apparent increased levels of motivation and task engagement, we observed that some learners appeared less reticent about presenting to other non-native speakers and actually demonstrated more initiative and problem solving skills than had been observed during group work situations in the traditional classroom. In one instance, a student became the group leader and quite outspoken, a complete contrast to this student’s typical classroom demeanor. The 3D environment appeared to generate excitement and gave students the freedom, flexibility, and autonomy that ultimately motivated them to work more collaboratively in a fun, risk-free environment—a gaming environment in which many of them participated easily as experienced “gamers.” Consequently they felt comfortable manipulating and moving around this new learning space, perhaps more so than moving around the traditional language classroom. It is important to note that this task was executed and piloted during a very short period of time and at the end of term. The teacher and students were all new to 3D environments and had no previous gaming experience. Yet preliminary teacher observations suggest that ESLA learners might benefit from alternative learning environments like CV because they are fun, autonomous, and relevant, providing the task is challenging and generates opportunities for language production. Historically, language and immersion are mutually complimentary terms. Intuitively, 3D immersive environments could be exciting new venues for exploring future language teaching and learning initiatives. As part of the presentation, student groups were asked to reflect on the advantages and disadvantages of collaborating and presenting in CV. While student feedback was generally positive, there were some challenges. Overall, learners liked this unique and interesting learning opportunity and commented on how it was more active and attractive to people in their generation, who like and are at ease with technology. Students liked the fact that communication was easy, synchronous, and more similar to face-to-face communication than other learning platforms common to them. Students commented on the ability to integrate other web-based resources like web renderer (a screen that allows real-time web access in virtual environment). Challenges included technology and internet access, which were not always compatible or working. Students also commented on a lack of privacy in the environment and lack of eye contact or body language, which might be particularly challenging for students with poorer oral communication skills. We believe this context for learning has tremendous potential as a possible alternative to, but most certainly an extension of, the traditional language classroom. Environments like CV provide alternatives to the traditional language classroom that some students might find beneficial because they permit students to experiment with new roles as they form their own learning communities in a safe environment. This pilot describes just one possible scenario for language learning in 3D immersive environments. Task design should promote interaction and communication through role-play, exploration, information quests, and so on. CV provides a physical space wherein students practice and use the target language with other students and native speakers. The truth-value of archaeology is not self-evident. There is a huge gulf between the primary data and the “final” interpretation. The training of archaeologists typically takes place in North America within the confines of academic archaeology. In that context, students’ experience of archaeology tends to be short summer field experiences. We are loath to allow students to get their hands on real archaeology because the available time, money, and resources are too limited to allow our students to make mistakes. There is of course more to archaeology than simply field work, but even in those cases there is a reluctance to allow students to actually work with the materials, to make mistakes. In some institutions, it is entirely possible to graduate with a degree in archaeology without ever having spent more than two weeks doing field work (Graham, personal experience). Yet, by some estimations, the typical student only ever takes in about 10% of a lecture—a 5,000 word lecture distills in the student’s notes to a mere 500 words (Johnstone and Su 1994). This kind of teaching/learning has been disparaged as “one tape recorder talking to another” (Foreman et al. 2004, p. 52). The prototype immersive archaeological experience is built on the results of a 2003 excavation conducted by Shawn Graham (Carleton University) and Andrea Bradley (Institute for Field Archaeologists, UK) in Shawville, Quebec (Bibliographie de l’inventaire des sites archéologiques du Québec MCCQ 3453, rapport inédit). That excavation was conducted in the context of a community revitalization project and was designed to introduce high school students to their community’s heritage as a summer field school in archaeology. The site was the Armstrong Brickyards, an industrial heritage site. A heritage park was proposed for the site, the “Armstrong Heritage Farm,” which covers an area of ca. 37 acres in Lot 6, Range 6 of Clarendon Township. The village of Shawville is notable in Quebec for its ethnic makeup of primarily Irish Protestants. Shawville sits on clay beds left over from the Champlain Sea; these clay beds were the source for a thriving brick industry in the late nineteenth century. One brickyard belonging to G. F. Hodgins was situated south of the village; another, belonging to the Armstrong family, was situated to the east on Lot 6. All surface traces of this brickyard have long since been erased. The excavation was directed with the intention of discovering the functional layout and extent of this brickyard on the property slated for development. We took the results of that excavation and simulated one of the 2m x 2m trenches in the web.alive environment, creating soil layers, features, and artifacts in their relative correct positionings. The video below shows how the simulation works and what kinds of interactivity can be performed there. Online multi-user archaeological simulations do exist. The University of North Dakota uses a stand-alone text-based simulation of the village of Like-a-Fishhook (Slator 2001). In Second Life, archaeological themes occur frequently (Graham 2007). An example with archaeological implications is Vassar College’s recreation of the Sistine Chapel (http://www.vassar.edu/headlines/2007/sistine-chapel.html). The Pyla-Koutsopetria Archaeological Project (http://www.pkap.org/) has used Second Life as a place to organize the logistics of their excavations, while the “Remixing Çatalhöyük” project (http://okapi.wordpress.com/2007/04/07/constructing-knowledge-virtual-places/) (Morgan 2009) uses it to understand the architectural layout of that city and the social life lived within it. 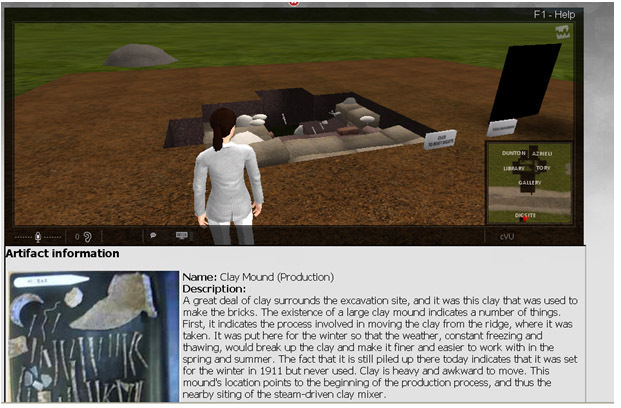 None of these simulations, though, recreates the logic of excavation or allows the user to interact with the basic building blocks of archaeological knowledge creation. In our initial assessment of the excavation, we wanted to explore whether or not the system made sense intuitively—if, in interacting with it, some appreciation of how archaeological knowledge is created was developed. A second aim was to understand how engaging it was and what worked or did not work for the students in this regard. Archaeology in the “‘real world”‘ is often compelling due to its romantic or mysterious nature, its social context of practice. While often decried, this romanticism is a major factor in maintaining interest in what is a physically and mentally tedious process. In the “‘doing’” of archaeology, the social aspect, the conversations, that surround the process are formative in the development of understanding (Wilkinson 2007). Accordingly, we encouraged the students to ‘talk aloud’ throughout their interaction with the excavation and with each other. None of the student volunteers had any archaeological experience aside from one introductory lecture on archaeological landscapes. The students were divided into two groups. One group was introduced immediately to the 3D simulation; the other group interacted with a 2D simulation developed by the Friends of Bonnechere Parks (http://www.virtualmuseum.ca/Exhibitions/Spirits/English/Dig/digdown.html). The 2D simulation was selected for comparison as it is a well-developed example of archaeological outreach and a teaching tool expressly meant to address the same issues as our own prototype. Both groups of students were given graphing paper and recording sheets and instructed to talk aloud as they sought to understand what the site they were looking at represented. Afterward, they were asked to complete a questionnaire that reproduced the questions asked by Getchell et al. (2007), which detailed a similar experiment, in order to enable cross-project comparability. These questions were assessed on a five-point Likert scale, where the respondents indicated their degree of agreement with various statements, as shown in Tables 2 and 3. Game world environments are not designed with the intention that the players or participants can make substantial changes to the underlying simulated geomorphology. The initial problem then was to work out how to translate the metaphors of archaeology—layers, contexts—into three-dimensional manipulables within a world not meant to allow the manipulation of the underlying geomorphology. In essence, to allow users to dig down, we had to build up. We translated each excavated context into an object within the web.alive environment. Each context was then positioned to match the x,y, and z relationships observed in the real-world excavation. Artifact models were created and positioned within the appropriate context. Each artifact model was linked to a web page giving a basic physical description of the artifact. Each of these information pages contained links to archaeological databases, catalogues, or other secondary sources. Each context contained a trigger to cause it to “‘melt away”‘ to simulate the careful removal of the soil. A trigger positioned outside the excavation would, when pressed, overlay a horizontal grid on the excavation to allow users to measure and plot the positioning of contexts and artifacts. Finally, a browser window was provided near the excavation site to allow users to perform web-based research from within the simulation. The questions and answers for 2D and 3D tools are shown in Table 2. The same questions were used for both tools. The answers ranged from Strongly Agree to Strongly Disagree. The data in each column show the number of participants who selected the corresponding answer. The prompt to “think aloud” seemed to generate a good deal of critical reflection among the participants. The 3D environment provided tangible feedback in a way that the 2D simulation did not (could not?). The students felt that the “‘basics’” of archaeology were well enough conveyed by both simulations, but they certainly were more excited by the 3D world. Rather than seeing this as a design flaw, in discussion among themselves, they felt that it could in fact be a feature if it were tied to the logic of excavation—if, for instance, one dug too deeply too quickly, maybe the site would collapse (a real danger in real-world archaeology); or if one “ripped out” artifacts (that is, clicked on artifacts visible in lower levels, even though the overlying contexts had not yet been removed), one could damage the artifact and lose the information. Unprompted, they had stumbled into an understanding of why looting matters. The students were directed to work out what the site represented. With that minimal instruction, the students would position their avatars at different points of the compass so as to get a camera view of the excavation from all angles, directing each other over the voice channel of where to stand. Then, they’d discuss how things looked from their particular point of view in order to record relationships. These results can be considered no more than anecdotal, of course. However, by focusing our design on engagement, we seem to be reaching our initial group of use-testers at the level that we desired. The design of the simulation and the affordances of immersive virtual experience seem to be promoting the kind of emergent learning about archaeology that we should wish to promote to a wider public. When things broke in the excavation, or the students pursued a blind alley, they could hit the “reset” switch and start again. It was safe to fail, and thus promoted exploratory and constructivist learning. Both kinds of simulation had their strengths and weaknesses (see table 2), but the 3D simulation seemed to elicit stronger agreement from our use testers when asked if it helped develop understanding; it also seemed to be a better environment for fostering group learning. While our results cannot be considered quantitative, they do demonstrate ways in which this particular 3DVE can promote accessible learning. Web-based design, scripting and customization, 3D spatial sound, AI and NPCs, and various other features allow the proposed 3DVE to provide a useful, effective, and affective framework for academic activities, communication and collaboration, simulation, and presentation. The first case demonstrates the ability of 3DVE to provide information in a more engaging way including NPCs and some AI. The second case adds communication, collaboration, and environmental simulation. Finally, the third case advances the simulation to a more interactive task and also shows how the 3DVE experience can be customized and integrated within a special web page. As the case studies indicate, 3DVEs on their own may not offer a full alternative for other learning tools, but when carefully designed with an eye toward the affordances of the technology, they can supplement other forms of pedagogical practice. Lack of real face-to-face communication, learning curve and usage difficulty for many users, and hardware and software requirements are among the barriers to more wide-spread use of 3DVEs. Although they may provide a less expensive solution compared to setting up physical facilities, 3DVEs still involve development costs and skills not available easily and affordably in some cases. Simulating more complex tasks (such as those involving fluids and complicated machines or those requiring realistic human expressions) are also challenging while advances are rapidly made toward making them possible. Additional research is needed to develop proper evaluation criteria and perform more detailed qualitative and quantitative studies on functionality and usability of 3DVEs. Ally, Mohamed. 2008. “Foundations of educational theory for online education, development and delivery.” In The theory and practice of online learning, edited by Terry Anderson and Fathi Elloumi, 15-44. Athabasca, AB: Athabasca University Press. OCLC 226999285. Augar, Naomi, Ruth Raitman, and Wanlei Zhou. 2004. “From E-learning to Virtual Learning Community: Bridging the Gap.” Lecture Notes in Computer Science 3143: 301-308. Springer-Verlag. OCLC 764380182. Boas, Franz, and Franziska Boas. 1944. “Dance and Music in the Life of the Northwest Coast Indians of North America (Kwakiutl).” In The Function of Dance in Human Society: A Seminar Directed by Franziska Boas, 5-19., Chicago, IL: Princeton Book Co. OCLC 81413796. Boulos , Maged N Kamel, Lee Hetherington, Steve Wheeler. 2007. “Second Life: An Overview of the Potential of 3-D Virtual Worlds in Medical and Health Education.” Health Information and Libraries Journal 24: 233- 245. OCLC 437527110. Brown, John Seely, and Paul Duguid. 2001. “Knowledge and Organization: A Social-Practice Perspective.” Organization Science 12: 198- 213. OCLC 484548146. Callaghan, Michael, Kerri McCusker, and Jim Harkin. 2009. “Teaching Engineering Education Using Virtual Worlds and Virtual Learning Environments.” International Conference on Advances in Computing, Control, and Telecommunication Technologies. Trivandrum, Kerala, India, December 28-29. Danilicheva, Polina, Stanislav Klimenko, Yuri Baturin, and Alexander Serebrov. 2009. “Education in Virtual Worlds: Virtual Storytelling.” International Conference on CyberWorlds. Bradford, UK, September 7-11. Demiris, George. 2005. “Virtual Communities in Health Care.” StudFuzz 184: 121-122. OCLC 210093149. ———. 2006. “The Diffusion of Virtual Communities in Health Care: Concepts and Challenges.” Patient Education and Counseling 62: 178- 188. OCLC 442286007. Eysenbach, Gunther, John Powell, Marina Englesakis, Carlos Rizo, and Anita Stern. 2004. “Health Related Virtual Communities and Electronic Support Groups: Systematic Review of the Effects of Online Peer to Peer Interactions.” BMJ 328:1166. OCLC 195748799. Foreman, Joel, James Paul Gee, J. C. Herz, Randy Hinrichs, Marc Prensky, and Ben Sawyer. 2004. “Game-Based Learning: How to Delight and Instruct in the 21st Century.” EDUCAUSE Review 39 (5)50-66. OCLC 107970252. Graham, Shawn. 2007. “Second Lives: Online Worlds for Archaeological Teaching and Research: Linden Labs, Second Life, www.secondlife.com.” Special Reviews Section, European Journal of Archaeology10(1):77-79. OCLC 4658297828. Getchell, Kristopher. 2007. “Evaluating Exploratory Learning in Lava.” Sixth IASTED International Conference on Web Based Learning. Chamonix, France, March 14-16. Johnstone, Alex and Wy Su. 1994. “Lectures: A Learning Experience?” Education in Chemistry 31 (3): 75-79. ISSN 0013-1350. Kurath, Gertrude Prokosch. 1986. Half a Century of Dance Research: Essays By Gertrude Kurath. Flagstaff: Cross Cultural Dance Resources. OCLC 15428099. ———. 2000. Iroquois Music and Dance: Ceremonial Arts of Two Seneca Longhouses. Mineola, New York: Dover Publications, Inc. OCLC 611995743. Morgan, Colleen. 2009. “(Re)Building Çatalhöyük: Changing Virtual Reality in Archaeology.” Archaeologies 5 (3): 468-487. OCLC 471892437. Slator, Brian. 2001. “Teaching with Immersive Virtual Archaeology.” Paper presented at the Seventh International Conference on Virtual Systems and Multimedia, Berkeley, CA, USA, Oct 25-27. Sweeney, Breen. 2008. 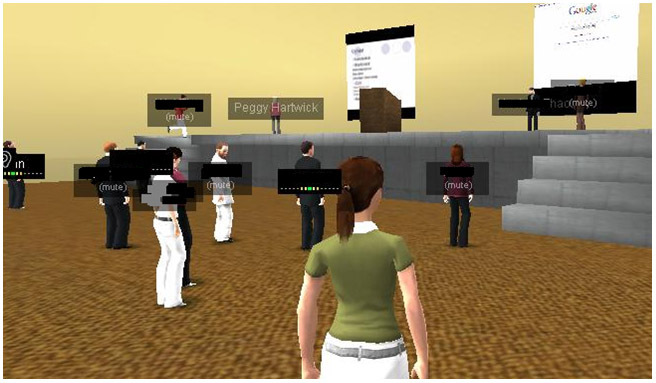 “Mathematics in a Virtual World: How the Immersive Environment of Second Life Can Facilitate the Learning of Mathematics and Other Subjects.” Proceedings of Researching Learning in Virtual Environments Conference. Milton Keynes, UK, November 20-21. Vickers, Howard. 2010. “VirtualQuests: Dialogic Language Learning with 3D Virtual Worlds.” CORELL: Computer Resources for Language Learning 3: 75-81. ISSN 1988-1746. Wilkinson, David. 2007. “Writing Archaeology and Writing Fiction.” The London Archaeologist 65: 14-15. ISSN 0024-5984. Wright-McLeod, Brian. 2005. The Encyclopedia of Native Music: More than a Century of Recordings from Wax Cylinder to the Internet. Tucson: The University of Arizona Press. OCLC 56880467. Ali Arya has received a Bachelor’s Degree in Electrical Engineering from Tehran Polytechnic, Iran, and a Ph.D. in Computer Engineering from the University of British Columbia, Canada. With years of experience in industry as a software engineer and project manager, and also research and teaching positions in various academic institutions, since 2006 Ali has been with the School of Information Technology, Carleton University, Canada, where he is an Associate Professor of Interactive Multimedia. His research interests include Computer Graphics and Animation, Computer Games and Virtual Worlds, Artificial Intelligence, Human-Computer Interaction, Digital Art, and Educational Technologies. Ali’s research has been funded by National Science and Engineering Research Council, Social Science and Humanities Research Council, Ontario Centres of Excellence, and industrial partners. Ali is senior member of IEEE, a member of ACM, and on the editorial board and technical committees of various journals and conferences in the areas related to his research. Peggy Hartwick is an Instructor at Carleton University and holds a Master of Arts in Applied Language Studies. She is currently pursuing a Graduate level diploma in Educational Technology. As an experienced language teacher, Peggy develops educational programs and tests, and specializes in English for Academic Purposes. Her main focus is on developing oral communication and academic writing and research skills. She is passionate about creating and executing blended courses using traditional, online, and virtual teaching environments. Peggy’s current research interests are centered on 3D virtual learning environments, which provide exciting teaching and learning contexts. Shawn Graham, Assistant Professor of Digital Humanities in the Department of History at Carleton University, is a Roman archaeologist who uses simulations, agent based modeling, and network analyses to explore ancient history. He has taught at all levels from high school to adult continuing education. His publications have brought together digital media for teaching and learning, and research in history and archaeology. Nuket Nowlan has a Master of Engineering in Technology Innovation Management (TIM) from Carleton University (Canada) and a B.Sc. in Electrical Engineering from Boğaziçi Üniversitesi (Turkey). Ms. Nowlan is an experienced project manager and has overseen many immersive virtual world research projects including Tipontia (Ronald McDonald House, Children’s Hospital of Eastern Ontario), Persephone (Algonquin College, Ottawa, Ontario) and Carleton Virtual (Carleton University, Ottawa, Ontario). Currently, Nuket is the technical advisor for Algonquin College’s 3D immersive campus project. She is the founder of the company called 3D Virtual Crafting. Living during a time of profound change can be at once exhilarating, inspiring, alienating, and frightening. With the new comes possibility, but also uncertainty. That is the reality of the information age and the increasing presence of digital media and interactive technology in our daily lives. It is even more so the reality in educational institutions where experimental, innovative thought often makes strange bedfellows with disciplinary orthodoxy and tradition-bound deliberateness. This article is a discussion of how we balanced these tensions in the process of implementing digital media at the Bard Graduate Center1 (BGC). At the BGC, our integration of digital technology has focused on the evolving demands and interests of our community. Rather than equip a lab that was aimed at certain predetermined digital practices, such as data mining, geospatial mapping, or textual analysis, we envisioned the Digital Media Lab2 (DML) as a space that would provide resources, knowledge, and support for technological experiments that would emerge from research projects and pedagogical practice already in development at the BGC. We focused on working with faculty and students to determine how digital media could best enhance their existing projects rather than initiating unprecedented and perhaps unwelcome projects. We did this by using successful projects as models to hold up as proof of concept to the uninitiated and uncertain members of our institution. This approach has made the work coming out of the lab more relatable and accessible to the community as a whole, and as a result has increased the rate of adoption of digital practice throughout the institution. From laying the foundation for our digital media initiatives to equipping our lab and working with our institution’s different constituencies, we have learned a number of important lessons about simplifying an institution-wide transition to new digital technologies. As I detail how we went about establishing the DML, I will reiterate that understanding the community’s needs and providing the software, hardware, and human resources necessary to allow those projects to flourish, has been key to our successful integration of digital media throughout the BGC. From the beginning we have endeavored to develop a more humane cyberinfrastructure, one that provides our institution’s humanistic scholars with the technology, knowledge, and support to rethink their projects and experiment with new approaches. What exactly do I mean by a humane cyberinfrastructure? Let’s start with the term cyberinfrastructure. The final report of a National Science Foundation (NSF)-funded workshop on the incorporation of cyberinfrastructures in social sciences defined the term as “the coordinated aggregate of software, hardware and other technologies, as well as human expertise, required to support current and future discoveries in science and engineering.”3 In this sense, cyberinfrastructure is compelling as it implies the thoughtful aggregation of cutting-edge technology with human expertise, clearly paralleling our goals in the DML. But as Patrik Svensson points out, “much discussion of cyberinfrastructure is technology-driven, data-driven and structural-level.”4 Svensson is wary of adopting a science-and-engineering mindset in the consideration of a possible humanities cyberinfrastructure, warning that mapping structural and epistemic modes from these fields misses the point of the specific type of work done by humanists.5 We therefore expanded our research infrastructure cautiously as we kept in mind this disconnect between the possibilities of cyberinfrastructure and the manner in which it is implemented, and the danger of mapping cyberinfrastructures onto humanities research in a way that simply mimics work done in the sciences and engineering. This brings us to the notion of a humane cyberinfrastructure. At one level the term “humane” evokes the humanities and distinguishes the specific humanistic approach we have taken in the DML. However, in the case of the DML, “humane” additionally connotes the sensibility that determined not only the design of the space and the technological capabilities of the lab, but also our approach to people as they experienced those technologies. The use of the word humane comes from Jef Raskin, one of the creators of the original Apple Macintosh, and his play on the concept of human interface design in The Humane Interface. Raskin says that that “if a system’s one-on-one interaction with its human user is not pleasant and facile, the resulting deficiency will poison the performance of the entire system, however fine that system might be in other aspects.”6 While Raskin is specifically calling for a corrective in the design of human-computer interfaces in software and hardware, his notion of what deficiencies will cause a software or hardware system to fail also hold true for the development of cyberinfrastructure, whether it is in the sciences, social sciences, or humanities. For Raskin, successful interactive systems pay heed to the human factors of user experience, and he states that “an interface is humane [Raskin’s bold] if it is responsive to human needs and considerate of human frailties.”7 It is this humane sensibility and focus on responding to human needs that we have kept as the core of our methodology in establishing the DML. Making sure that we have been humane in establishing the Digital Media Lab as the hub of our new cyberinfrastructure has allowed us to provide both a space for experimentation and innovation and one that welcomes equally eager early adopters and those with apprehension over the changing role of technology in the academy. Such a consideration of the gamut of potential users is particularly important in attempts to encourage work with digital media throughout an institution. Skill levels, commitments, and even insecurities can vary greatly across a community, and these factors strongly influence who chooses to participate and who does not. The more humane the system, the more readily it can respond to those frailties, and the less likely it is to poison the project throughout an institution. At this point some specific institutional background would help. The BGC is a research institute in New York City that is home to a graduate program in Decorative Arts, Design History, and Material Culture. The four-story BGC Gallery puts on approximately four exhibitions every year. Additionally, the BGC publishes a wide range of texts including exhibition catalogs, a scholarly journal, and a book series. As the range of possible experimentations with new media across all three areas of the institution—academic programs, exhibitions, and publications—has became more apparent, the BGC determined to create a dedicated space to promote and support new initiatives in digital media across the institution. I was hired as a full-time staff member to conceptualize and implement these initiatives. In 2009, the BGC opened the Digital Media Lab to provide a place where students, faculty, and staff could come for assistance in incorporating digital media into research projects and course work. That first year was critical in establishing the lab within the culture of the BGC and setting the tone for generating interest among both the most eager and most skeptical audiences in the institution. During that time, we carefully considered the role of institutional history in shaping how the DML would function. We made sure to situate the DML within the preexisting programmatic structure—and culture—of the BGC as we planned how best to incorporate digital media throughout the institution. We knew that it would be important to have a well-defined understanding of why and how we wanted digital media implemented into our curriculum, and this understanding continues to affect our approach a day-to-day basis. At the BGC, our goal is to train future scholars, curators, collections managers, etc., and that education takes priority over the training of our students as filmmakers, web designers, or database programmers. While we wanted to open up the possibilities of digital media to the community, at the same time we wanted to keep our focus on the content and methodologies of our field and not aim to provide the type of education one would be more likely to find in a media arts program. To this end the new technologies we made available in the lab were meant to support and enhance the institution’s preexisting missions. Software packages such as the Adobe Creative Suite appealed to our focus on material and visual culture as well as design history, while the integration of platforms such as Omeka and the wiki hosting service Wikidot.com allowed us to experiment with digital publication and collections management practices relevant to our focus in museum studies. Prezi allowed for new modes of classroom presentation, and when paired with Google SketchUp, it provided students, faculty, and staff with a new set of tools for experimentation with visual prototyping and spatial design for projects in our galleries. These tools were all chosen to emphasize preexisting modes of practice from across the institution to ensure their relevance was apparent. The Assistant Director for the Digital Media Lab, along with two work studies, is readily available to answer questions throughout the week, and the lab is open whenever the building is. The lab was designed to mirror BGC’s core pedagogical values: small classes, readily available faculty (achieved through a 50:15 student:teacher ratio), and intimate educational structure. The staffing and availability of resources in the DML reflect these values. This accessibility and support has made the lab a familiar place, allowing students the freedom to experiment and feel comfortable taking risks with new technologies. In addition to fostering an intimate academic experience, the BGC is heavily invested in academic rigor and intellectual depth. We therefore take a highly critical stance toward the integration of digital media to ensure that the technology and media support that rigor and depth rather than replace it. We encourage the use of tools such as Prezi and wikis for student projects, but only inasmuch as they add to the quality of work and are able to provide analogues for traditional armatures of scholarship (such as footnotes and bibliographies). While we are excited about the possibilities that digital media provide for the expansion of scholarly practice, we discourage the use of these new media for the sake of surface-level aesthetic enhancements to traditional modes, such as the research paper. That being said, we understand the potential for new tools to enable new modes of interpretation and presentation that in fact expand the rigor and depth of work being done. To that end, the lab encourages students to experiment with different technologies and to develop a digital information fluency that is both relevant to their specific projects and applicable to the myriad materials, applications, and platforms now available to help them find information. Staying within our academic mission, encouraging a sense of institutional intimacy, and maintaining high academic standards are not particularly unique positions, nor are they so outlandish as to provoke much discussion. But they are the kind of positions that provide us with a healthy critical stance and programmatic self-awareness to make informed, appropriate decisions in developing our cyberinfrastructure. Working from a foundation such as this is critical for any institution considering how to integrate digital media successfully into its curriculum. Unless the use of media is fundamentally tied to faculty goals for the program and clearly defined to students as a logical extension of the core tenets of institutional practice, the integration of digital media has the potential to cause disillusionment, alienation, resistance, and fragmentation within the institution’s population. It becomes inhumane and prone to failure. Digital media are new, and with newness comes apprehension. That apprehension is best treated with conceptual clarity and the language of logical evolution rather than revolutionary calls to arms and disparagements of traditional practice. Clearly and repeatedly communicating an understanding of programmatic foundations can do much to assuage apprehension and uncertainty. Having laid out the history of the BGC and our general attitudes toward digital media, we can now get to some of the specific strategies we employ at the BGC in order to ease faculty, students, and curators into the use of digital media. The challenge for us with the introduction of the Digital Media Lab was to implement digital media into the curriculum quickly and pervasively but at the same time organically and voluntarily. The BGC, despite an inherent interdisciplinarity and investment in experimentation and innovation, in general remains a relatively traditional and conservative institution in research and pedagogical practice. That is of course changing with our new publications, faculty-led focus galleries, and digital initiatives, but when the project began three years ago, Photoshop, Powerpoint, and Word—hardly cutting edge technologies—were the primary digital tools in use. There had been only a few experiments with course software (Moodle, a blog or two, and a few custom-made HTML course sites) and very little use of social media, digital design, or video/audio editing tools anywhere in the institution. This provided us with an opportunity to start virtually from scratch, but also meant that we had to earn buy-in from faculty and provide entry points for a student body not necessarily armed with technical proficiency or expertise. While it is important to plan and think about approach, personalities, and implementation methodology, there comes a point where one needs to make real, strategic decisions about the resources required to successfully equip a digital media initiative. At the BGC, we have approached our acquisition of both hardware and software with very clear goals that would allow us to provide a flexible and powerful computing environment without spending wastefully. By coupling a successful project with a sensible approach to resource acquisition and allocation, we hoped to be more secure in continued funding and openness to expansion into more initiatives in the future. One way we have found a focus for equipping our digital media initiatives is to allow the intellectual questions asked by our community to drive our tool acquisition. We began by complementing more expensive foundational software suites, such as Microsoft Office and the Adobe Creative Suite, with a range of inexpensive entry-level tools and platforms, such as WordPress blogs, Wikidot.com wikis, Omeka, Google SketchUp, Prezi, and iLife. This range has allowed us to provide options and examples without committing to expensive systems that can require extensive external support, such as Blackboard. Additionally, it allows our students and professors to freely experiment with different tools and find what is right for their project. Furthermore, we have focused on using Internet-accessible tools that allow faculty and students to complete work from virtually anywhere so that they are not tied down to the lab and can collaborate asynchronously and remotely. In this sense, the DML is not a physical space, but rather extends out to these networked platforms and allows for online and hybrid activity. From these initial starting points, we can decide to spend more money on more elaborate software if projects demand, and be better equipped to make the right purchasing decision when the moment arises. In addition to providing this range of software, we wanted to make sure that the hardware we put in the DML was powerful enough that the only limitation new users would face would be their knowledge of the tool and not the capabilities of the computers being used. We aimed at relatively high-end computers so that there was less likely to be frustration with the speed of processes or their ability to run resource-demanding software, such as the applications in Adobe’s Creative Suite, smoothly. We purchased primarily iMac and Mac Pro computers8 with robust processors, large screens, and extensive memory. Macintoshes were chosen for a number of reasons: (1) they were the only computers that could easily run all three major operating systems (OS X, Windows, and Linux); (2) the majority of our students had familiarity with OS X and Apples in their personal computing life; and (3) while anecdotally more expensive, they actually provide higher performance over a longer period at an equivalent price to computers with similar capabilities, making them a cost-conscious choice. The Macintoshes have suited our needs well, as they have reliably handled a wide range of use and provide sufficient processing power so that the students rarely if ever voice frustration with their functionality. All software is updated approximately once a monthly to ensure that bug fixes and optimizations are applied, and when a machine is acting peculiar or sluggish we correct the problem as soon as possible to maintain the DML’s reputation as a reliable computing space. These specific hardware choices and maintenance practices reinforce our humane approach, as we limit the possibilities for the system to fail through neglect or lack of attention to user experience. As the DML has matured and the projects increased in scope, ambition, and specificity, we have made purchases that respond to specific project needs and provided new platforms to support experimentation related to our program. We purchased a NextEngine 3D scanner and a Makerbot Replicator for investigations into digital materiality and acquired lab licenses for Google Earth Pro and Oxygen XML Editor to prepare for future projects involving geospatial mapping, interactive timelines, and textual encoding. In addition, we have expanded our web hosting capabilities to respond to a number of projects across the institution and are for the first time working with an outside developer in our focus galleries who will work with students and faculty to actualize projects currently beyond the technological scope of the DML. All of these steps forward are meant to enhance our cyberinfrastructure in a way that responds to immediate needs and future possibilities and to help reinforce a sense of security that the lab will develop in accordance with the cumulative interests of the community. Along with computing power, platform flexibility, and infrastructure responsiveness, it is important in the early stages of a digital media initiative to consider the relative comfort level of different communities in your institution and pay heed to the needs of the learning community. Not all affordances can be made for every student or faculty member, but providing comfortable spaces and modes for people to work within is crucial to building up institutional momentum and encouraging individuals to take the bold step of going beyond their comfort zone and experimenting. If provided with options for experimentation, sufficient computing resources with which to work, and support for both technical and conceptual questions, the end result is often work that goes beyond what you may have even imagined their projects could become. Stay prepared and nimble for the inevitable technological change, and remember that while frugality is important one also mustn’t skimp on functionality as you risk limiting experimentation, creativity, and innovation. Faced with this newly equipped cyberinfrastructure, we adopted a few specific strategies for encouraging use of the lab and expanding the range of tools support. As mentioned above, our selection of digital tools was to be determined by the needs of the community. We eagerly sought out and looked to respond to faculty who wanted to try new research and pedagogical methods that took advantage of the resources provided by the lab, but the institution was not intent on mandating the use of any particular tools or even promoting a preference for particular platforms. At the outset we were uncertain as to how much participation we would get from faculty and students, but fortunately nearly a third of our faculty expressed some interest right off the bat and we were quickly using blogs, wikis, audio/video editing suites, new presentation software, and even computer-aided design tools in course work and in the development of long-term research projects. During these initial migrations by our community toward certain types of digital tools, we generated two doctrines for the DML. The first doctrine is: scholarly and pedagogical questions should determine what tools are used and not vice versa. The work at the BGC remains grounded in a humanistic approach to the asking and answering of questions. While the tools that we use enable us to answer questions differently, they should not predetermine the types of questions we ask. The digital is only a new approach to our discipline and not a new discipline in and of itself. When students or faculty come to me or Professor David Jaffee, our Head of New Media Research, with an interest in digital media, the first thing we ask them is what questions are they asking and how do they envision their teaching or research project. By listening closely at this stage, visualizing ideas through pen and paper mock ups, and talking through work flows and types of materials, we find digital solutions with no predispositions as to what tools are best suited to each project. A research project may work best on FileMaker Pro to allow for customization and robust searching or it may be best handled using a wiki so that many people can easily access and contribute information. A digital exhibition may be best designed using a database-driven platform such as Omeka or a bespoke HTML site may allow for easier introduction of multimedia and customization of presentation and style. A course site may work best as a wiki for the collection of files, images, and collaborative compositions, or it may work best as a group-authored blog with students crafting a voice and contributing at regular intervals over the course of a semester. Whatever the situation, the question comes first and the tool second. The second doctrine we have adopted applies to the types of tools that we choose: tools should have low barriers of entry and shallow learning curves. This mentality was born out of (a) our desire to not be a media arts program, and (b) the fact that the majority of our students are with us for only two years. It has however proved essential to our understanding of how to generate interest quickly and make digital media pervasive across our institution. One undeniable reality of working with academics and digital media is the general apprehension caused by not understanding how to use a tool. The best advice I received at the beginning of my time at the BGC was that, in general, professors are used to being “the smartest person in the room.” Learning a new tool can be extremely disempowering to people accustomed to this position, and if the introduction to a new tool is not handled properly the resulting alienation from digital media can be very difficult to repair. So the tools we choose have been purposely selected for their low barriers to entry—meaning that they are relatively accessible and somewhat familiar upon a user’s first experience—and shallow learning curves so that the user can notice marked improvements in their skill early and often enough that they feel comfortable and capable using that tool. These two doctrines, which put institutional imperatives and user experience first in our digital media practice, are representative of the strategies we employ to establish a humane cyberinfrastructure. They ensure that the DML responds to the demands of the scholarship throughout the institution, and that the intellectual priorities of the lab are aligned with those of our community. They also allow people working in the lab to feel like capable contributors to the evolution of the lab and its increasingly important role in the life of the institution. Outreach and communication are crucial to making headway across a broad range of institutional constituencies, no matter what the size of that institution. Students and faculty with packed schedules might be reluctant to put learning new and unfamiliar digital technologies on their daily radar. Understanding the varying conditions that members of your community operate within is particularly important as you try to generate interest and enthusiasm in experimentation. Most of the work of integrating digital media successfully into curricula is done in managing institutional politics, nurturing individual projects, and assuaging fears and apprehensions. Acting humanely and approaching your community as a collection of individuals each working with technology differently rather than as a homogenous group of digital media users will ultimately prove to be more important than the choice of tools and methods of implementation. One of the best ways to plan for how people will take to digital media is to consider what their expectations of the academic experience are. Often there is a preconceived notion that younger faculty will be more eager to work with digital media than older faculty because of the assumption that they are more likely to have used digital media in their personal lives. But what often turns out to be the case is that faculty who are comfortably tenured are more likely to take the risk of doing their work in a digital format, meaning that many junior faculty are loath to experiment in their research, publication, and pedagogy. There is also a misconception that students, who are increasingly immersed in a media culture at a young age, will eagerly embrace digital projects. In fact, many students are tied to a relatively orthodox view of what is expected of a student. In our program this means being able to use a word processor to write papers and Powerpoint to create presentations of images. The prospect of working outside of that framework, especially when the digital is considered above and beyond an already rigorous course of study, frightens many students away. Overcoming these attitudes requires a careful demystification of technology, an active support program, and a clear explication of the added value of using digital media in scholarly work. When developing new projects, create parameters that are achievable for the students, but that still show off the value of using media. Ensure that the faculty see experimentations with digital media as a logical progression in their research and pedagogy and not an external imposition they are being forced to cope with. In order to accomplish these goals, we work closely with our community from both the top down, getting the faculty on board creating assignments and projects that require digital media, and the bottom up, getting students excited about digital media so they will encourage faculty to allow them to integrate digital media into their course work. Just as the faculty and administration can set standards and provide validation for the use of digital media across a curriculum, students can provide impetus from below by finding new uses for tools and sometimes making unexpected steps forward in integrating digital media. Three encouraging developments from our second year came out student enthusiasm for using digital tools. The first development was the use of wikis for thesis research by a number of students. Rather than use traditional notebooks and Word documents, these students had begun tracking materials and research information on their own wikis because it made it easier to show their work to librarians, because they were more confident their material was backed up and secure, and because the wikis ensured that their work would be accessible via the Internet when they did not have their own computers handy. The second development began when one of our particularly digitally fluent students who had dabbled with Prezi began to show the tool to a number of students during classes and in the lab. Another student picked up the tool and became the on-campus guru, showing it to other students and creating rich Prezis full of audio and video for a number of our more digitally notable classes. These Prezis made their way into a number of our salons (which I will describe later), and as a result of the students’ interest in the tool, Prezi is now more readily accepted as a viable option for the many projects that require the presentation of visual materials. The third development has been the increasing use of wikis as courseware. Early on, the wikis had been successful in a number of classes, but during our second year there was a sudden surge of interest from the faculty, most notably from a number of faculty who had been uncertain about using digital media in any fashion. We discovered that the students had come to prefer the wikis as method of accessing readings and receiving course communication, and they were asking professors who did not have course wikis to set them up. The combination of a grassroots request from students and a willing faculty response is ideal in integrating digital media into curricula. It represents a shift away from the external impetus digital media initiatives usually hinge on and shows that once tools have penetrated the community enough, they come to be viewed as valuable in and of themselves and not because a particular individual is encouraging people to use them. However, all this institutional and grassroots interest is for naught if systems are not easy to use and supported properly. By monitoring challenging projects and tending to the most tentative individuals you can solve problems before they generate dissatisfaction and become deterrents to further digital work. Projects should be well supported and platforms should be well explained. I can’t say enough about the value of offering workshops and taking the time to provide individual training and advisement to faculty and students before, during, and after projects. It may seem an obvious statement, but many institutions choose to implement tools and then provide insufficient or poor support, dooming the tool to failure and creating resentment that takes a long time to repair. Along with supporting those projects that come about on their own, it also helps to stay one step ahead of your community’s interest in digital media. Waiting for people to come up with projects on their own will slow the process of integration. Seek out those individuals who may not necessarily be thinking about using digital media in a course or project, and talk to them about their options. Also identify students and faculty with media experience or interest in digital design and encourage them to think about alternative approaches to their work that take advantage of these interests. These individuals are important in setting precedents for adoption by the community as a whole. As their interests and skills become known in the community, these early adopters will also help make digital media a standard rather than an exception within the institution. For an example of all these strategies and mindsets in action, let us look at the digital media tool most used across the BGC, wikis on the Wikidot.com hosting service. As we considered how to support courses with digital media, we knew for certain that we were not interested in, nor were we big enough to require, a large learning management system such as Blackboard or Moodle. Systems such as these were too expensive and/or too wedded to pedagogical approaches that were not being practiced at the BGC. Initially some of the professors at the BGC expressed an interest in using WordPress for course blogs, but after some initial attempts were not happy with the interface or with an information management system that did not align with the way they approached their small, seminar-style courses. I had dealt with similar questions and concerns as an adjunct teacher prior to working at the BGC and had found the Wikidot wikis a useful solution because they allowed me to (a) build a course site without the restrictions of a learning management system, (b) avoid the management issues of a self-hosted MediaWiki installation, and (c) not have to do the work necessary to custom-build an HTML site for every course. So, as more professors expressed an interest in digital course sites, more of them were willing to experiment with the wikis, and I was able to provide them with examples of my own work and pedagogical strategies for implementing the wikis to the specific needs of their courses. The most successful implementation, and the project that really convinced the BGC community of the viability and relevance of digital media, was a course and exhibition development site for one of our focus gallery courses. Focus galleries are single-room, faculty-led exhibitions that develop mostly out of faculty research but also through course work completed by students. The wiki for this particular exhibition, Objects of Exchange: Social and Material Transformation on the Late Nineteenth-Century Northwest Coast, used the wiki both to organize course materials and student work and as a makeshift database for the catalog material and wall labels that the students were composing. Syllabus materials, along with audio files, images, and videos were all hosted on the wiki for the students to access. In addition, each in the exhibition (of which there were approximately thirty) had its own page with an image and a fillable text template included wall label information, bibliographic references, links to other relevant objects in the exhibition, tags, and a comment section for the student and professor to communicate with one another. The success of the Objects of Exchange wiki provided an example of how digital tools can be valuable as both pedagogical platforms and as tools for organizing resources. This project was critical to the uptake of the wikis and the initial successes of the DML because it provided a model created by a faculty member and used by students, and because it was not directly related to a course about digital media or led by one of the previously recognized digitally savvy members of the community. It made using the wikis seem within reach of anyone at the BGC, and as more people saw the potential of these tools, more of them began to ask about using the wikis as courseware, to organize research, or to plan an exhibition. One of the reasons that everyone at the BGC was able to see the value of the Objects of Exchange wiki was because of our deliberate effort to show as many people in the institution as possible how the tool helped with the process of research and teaching. In a discussion that parallels Raskin’s, Donald Norman in his book The Invisible Computer writes that “human-centered development requires three equal partners, three legs to the triad of product development: technology, marketing, and user experience.”11 If the DML is in a sense a new product that we are trying to convince a community to use, then after setting up the lab (technology) and endeavoring to be humane (user experience), the next step was to publicize our successes (marketing). We aimed to make the lab and its potential more familiar to our community. The newness of digital media means that for the most part people either will not seek out tools on their own or are unsure where to start looking for new ideas. This is especially true for students and faculty who are often overwhelmed with the projects they are working on as it is. Therefore, we have made a concerted effort to make visible to our community those projects that most successfully represent the scope of work that can be accomplished by integrating digital media into work across our institution. Along with my constant proselytizing, orientations, and frequent spontaneous conversations, an important way that we have increased visibility has been through salons that we hold at the beginning of each semester to present successful digital works. These presentations have included course and exhibition wikis, student use of databases and wikis for thesis research, short films and Prezis made by students to present materials gathered from field trips, digital exhibitions designed in Omeka, and three-dimensional virtual galleries created for an exhibition design course. For one project, an HTML website entitled Visualizing Nineteenth-Century New York12 that was produced almost entirely by ten students with little previous web experience, we even had a launch party to highlight not only the final product, but also the work the students did while developing the site and the experience they gained in the process. These showcases have been most important in bridging the gap between those who know the tools but don’t know specifically how the tools would fit into other people’s work and those who know they want to explore the digital but don’t know what tools are out there or how they could use them. In order to bridge this gap, people must be shown projects that they can understand that showcase how successful projects make use of different tools. In this way they can both better understand how the tools work and imagine how they might expand their work into the digital realm using those tools. Prezi has also become highly visible as its ease of use in positioning textual, visual, and even multimedia materials in an easily editable and navigable infinite two-dimensional canvas has suited many different types of work done at the BGC. Students use Prezi most obviously as an alternative platform to Powerpoint to create class presentations, but the tool has also found uses as a thought mapping tool and an image management platform, in the creation of a collaboratively edited visual syllabus, and in the prototyping of interactive media meant for viewing both online (websites and student digital projects) and in our galleries. Along with Prezi and the wikis, the general activity in the DML includes a wide array of projects and applications. Video projects have become increasingly popular as students look for new modes of expressing themselves and faculty challenge them to consider how digital media are best suited to presenting their scholarly work. Two courses have approached these videos differently, one using them as thought essays and the other encouraging a more documentary style, but both produced excellent results that left students eager to engage with video as a medium. FileMaker Pro is used by many people looking to build custom databases for their research, especially Ph.D. students with slower–paced, long-term projects. Omeka, which students use in classes and for individual projects, has become an increasingly important tool and is the platform we are using for an archive of digital student work that is currently in development. This archive will be a place where we can catalog and store the variety of different digital projects done at the BGC, while also creating a repository upon which professors can build websites and presentations when showcasing their pedagogical practice. Perhaps the most significant achievement of the past year was the completion of our first digital-born qualifying paper.13 This project put many of the strategies, doctrines, and methodologies we had developed to their most extreme test, and posed a challenge to the synthesis of technology and human factors. Most other work done through the DML had been related to individual research or coursework as special projects, and not tied so directly to the mandatory qualifications of our degree. But in the case of a qualifying project (QP), we knew that it was of the utmost importance that the first digital-born project meet a few conditions. First of all, while the student would have to be digitally capable, she would most importantly need to demonstrate the ability to produce highly rigorous academic work. Professor Jaffee and I were keenly aware that if this project failed academically it could set a bad precedent and discourage future digital projects. Secondly, the student needed to understand that the completion of this project would require work above and beyond the level expected for a traditional QP. Introducing digital features would not reduce the expected page count of the project, and those digital features would necessarily require more labor and design concerns than traditional QPs. Finally, she needed to ensure that the digital aspects would be perceived as necessary to the project, not as frivolous and cosmetic. It needed to be digital-born and constructed in a manner that was irreproducible in non-digital media. We were fortunate to have a student, Caitlin Dover, come to us whose project not only met all those conditions, but who had also been involved in a number of our most developed digital projects, including the Visualizing Nineteenth-Century New York site and the video documentaries produced in Professor Jaffee’s course on twentieth-century material culture of New York. Caitlin created an interactive Flash project14 about the design and culture of telephony in the United State in the first half of the twentieth century. Her project integrated a gallery of navigable images and films with relevant essays. There were multiple points of entry to each media object that allowed for a nonlinear experience of all the materials, and animations that highlighted and connected different relationships between each of the media objects. The final product was of the highest quality and is something that we are proud to show. But the challenges of such a project ended up being very real. Caitlin exerted an enormous amount of effort in learning Flash from scratch while simultaneously researching and conceiving of the project, and the quality and amount of work she accomplished was not something that many of our students could have duplicated. I was also able to dedicate more time to helping Cailtin than would have been possible if multiple students had been working at the same scale. Lastly, the project did raise questions about the assessment of digital versus non-digital QPs. The work was of high enough quality that there was no question that Caitlin would receive a passing grade. But it did raise questions among the faculty as to the how to compare such a work to a twenty-five-page printed document. It really was a question of apples and oranges that we were not completely prepared to handle, and if the quality of the work had been more suspect could have caused tension within the institution. In a sense, Caitlin’s QP is a clear example of how far we have come, but also how far we have to go. On the one hand, there was little faculty resistance to the possibility of a digital-born QP, and they were interested in Caitlin’s endeavor, eager to see what her work would look like, and in the end impressed by its design, functionality, and academic content. On the other hand, there remained this question of assessment that reinforced the strong sense that we as an institution and across the academy are in the midst of a contested transition. They want to participate in that transition and for change to happen at the BGC to occur on their terms. For this reason, we continue to proceed with caution in these more sensitive areas, tempering excitement and possibility with carefully planned strategic decisions that consider the human factors that come into play when trying to institute such cultural change. It sounds cliché, but good things can come to those who wait, and considering the rapid developments that our humane approach has engendered so far, we are willing to allow those more difficult transitions to happen on a timescale that more healthily matches our community’s needs. Our methods of integrating digital media into the curriculum at the BGC have worked in a specific place at a specific time and in that respect they are unlikely to be completely effective in all circumstances. Questions of scale, resources, and personalities make each institution unique, and that uniqueness always plays a significant role in transitional periods as a community reacts, resituates itself, and prepares to move forward under a new set of conditions. So perhaps the most important lesson that this article can convey is that no matter how much planning you do, it is always prudent to allow the community to find its own way through the transition period. For those of us who are excited by and look to engage with digital technologies, it seems almost a fait accompli that these tools have value and should quickly find their way into pedagogical practice. But, as mentioned above, educational institutions are often full of very smart people who may not necessarily share that opinion wholeheartedly. The real challenge in digital media initiatives, therefore, does not lie in the implementation of the right software or the purchasing of the right hardware, it consists of creating an environment where the apparent value of these technologies can become known, accepted, and embraced. As you think about your own plans for integrating digital media at the programmatic and institutional level, remember that programs and institutions are made up of people, and it is ultimately their enthusiasm for these new tools that will lead to their successful adoption and integration. That is why it is important to focus on human expertise and to adopt humane practice, because it is the people in your institution who need to be convinced that this is a project that is relevant to them and to their work, and is ultimately in their best interests. Boyer, Mark, Caitlin Dover, Aislinn Hyde, Matthew Keagle, Michelle Messer, Rebecca Mir, Ruth Osborne, and Miranda Peters. n.d. Visualizing Nineteenth-Century New York: A BGC-NYPL Digital Student Exhibit. http://resources-bgc.bard.edu/19thcNYC/. Dover, Caitlin. 2012. “Making Connections: Visualizations of American Telephony, 1900–1949.” New York: Bard Graduate Center: Decorative Arts, Design History, Material Culture. Glass, Aaron, and Kimon Keramidas. 2011. “On the Relational Exhibit in Analog and Digital Media.” In Objects of Exchange: Social and Material Transformation on the Late Nineteenth-Century Northwest Coast: Selections from the American Museum of Natural History, edited by Aaron Glass, 215-225. New York: Bard Graduate Center: Decorative Arts, Design History, Material Culture. ISBN: 9780300174427. Miller, Peter 2011. Miller’s Peiresc Research, February 14. http://peiresc.wikis.bgc.bard.edu/. Raskin, Jef. 2000. The Humane Interface: New Directions for Designing Interactive Systems. Reading, MA: Addison Wesley. ISBN: 0201379376. San Diego Supercomputer Center. 2006. “NSF Workshop on Cyberinfrastructure for the Social Sciences, 2005 — About,” 2006. http://web.archive.org/web/20060105171914/http://vis.sdsc.edu/sbe/. Schnapp, Jeffrey, Peter Lunenfeld, Todd Presner, and et.al. 2009. “The Digital Humanities Manifesto 2.0,” June 22. http://www.humanitiesblast.com/manifesto/Manifesto_V2.pdf. Smith, Kathleen. 2009. “Q&A with Brett Bobley, Director of the NEH’s Office of Digital Humanities (ODH) | HASTAC.” HASTAC, February 1. http://hastac.org/node/1934. Spiro, Lisa. 2012. “Getting Started in Digital Humanities.” Journal of Digital Humanities, March 10. http://journalofdigitalhumanities.org/1-1/getting-started-in-digital-humanities-by-lisa-spiro/. ISSN: 2165-6673. ———. “‘This Is Why We Fight’: Defining the Values of the Digital Humanities.” In Debates in the Digital Humanities, edited by Matthew K. Gold, 16-35. Minneapolis: Univ. of Minnesota Press, 2012. ISBN: 9780816677948. Svensson, Patrik. 2011. “From Optical Fiber To Conceptual Cyberinfrastructure.” Digital Humanities Quarterly 5 (1). http://www.digitalhumanities.org/dhq/vol/5/1/000090/000090.html. ISSN: 1938-4122. The mission of The Journal of Interactive Technology and Pedagogy is to promote open scholarly discourse around critical and creative uses of digital technology in teaching, learning, and research. For this general issue, we are interested in contributions that take advantage of the affordances of digital platforms in creative ways. We invite both textual and multimedia submissions employing interdisciplinary and creative approaches in the humanities, sciences, and social sciences.